Need to Save Money & Buy Banners On the Cheap? 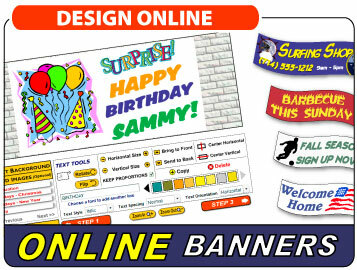 Order Wholesale Banners For Cheap Online 24/7. Hundreds of Inexpensive Vinyl Banner Sizes Up to 10ft High & 30ft Long. Contact for Custom & Larger Sizes. 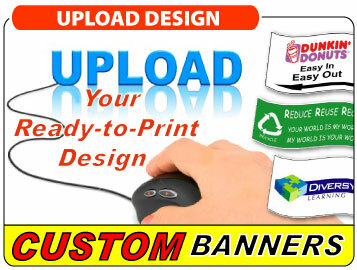 Looking for Custom Banner Printing Nearby? Searching For "Vinyl Sign And Banner Printing Near Me"? We Offer Free Pickup For Local Customers. Whether You're Near or Far, We Ship Nationwide! Contact us If You Have Questions About Delivery Time. Friendly, Responsive Customer Service. Have Questions? Contact us. Our Signs/Banners are the Least Expensive, Most Effective Method of Promoting Your Business or Event! * Current Shipping Policy is listed on the Checkout page. We have a client that needed a banner overnight and because I had never used you before I decided to also have a local vendor print the banner in case yours didn't arrive in time. Not only did the banner arrive in time, the colors were more accurate, the substrait was higher quality, a hem was included (local vendor didn't include a hem) and it was half the price, priority shipping included! I am super impressed with the results of this order and will be using you for our future banner orders. We needed a banner for a charitable event in 5 days and 1DayBanner.com did a fantastic job! Not only was the banner more than we expected, we received it 2 days prior to the event. I will definitely be doing business with you again and recommending your company to other business associates. I recently needed a very short turn-around banner and needed some help and pointers with accomplishing this. I was very impressed with the service, communication and personal attention I received from the 1DayBanner team. They helped me figure out the how, what, where and when and I actually did have a beautifully produced banner in my hands in one business day! 1DayBanner is a great combination of the advantages of the speed of the internet and digital technologies together with great personalized service and follow-up. 15 banners and everyone absolutely loves them ~ being picky with quality, they have high expectations and you met every expectation! Thank you so much from the bottom of our hearts... the Great Danes send hugs and slobbers! One of my friends told me about your site. He told me about the quality of your banners and how fast you shipped them. I must admit he was right and I am very impressed. I love the banner you made for me. Low price too. I just wanted to say thank you for doing an excellent job on our banner. Your outstanding customer service and even better prices will keep me coming back and recommending you to our associates. Thank you for great service! I love my "Happy Birthday" banner, it looks much better than what I was expecting. My mother who is turning 70, will love it as well. This is a high quality, fast, reasonable priced service! Also, I found the self-design process the best available - it was the ultimate reason I chose this service over the competitors. The clip art and fonts were plentiful and easy to use! Thanks a lot, the banner arrived quickly and looks fantastic!! We used it at our band's performance last night for the festival. 1DayBanner does excellent work, highly recommended, thanks again! Our Printing Technology: We employ state-of-the-art large format printers to ensure you're thrilled with your purchase, The quality of vinyl banner printing has now evolved to a level where it is possible to print just about anything on a vinyl banner including full color photographs. Whether you're planning to use our low-cost fast signs indoor or outdoor, they are meant to grab people's attention. Don't be afraid to choose bold colors, lettering and graphics to make it eye-catching and memorable. Their shape, from the standard rectangle to a square, all depend on your location, space requirements and style. They can be used for many years (even in harsh weather conditions) and still stay bright and vivid. Some of the most common applications and uses include purchasing inexpensive banners for a Birthday, Business, Church, Company, Graduation, Halloween, Promotion, Retail, School, Sports, Stadium, Grand Opening, Trade Show, Wedding and various other Events. Common Vinyl Banner Uses: The most common uses occur when a rigid, more permanent (and of course, more expensive sign) is simply not necessary. Although, they can last outside up to 3 years in the right environment. They are extremely versatile and can be hung from cords, attached to the ceiling, held up by a stand, mounted with a bracket or even glued to a wooden frame. An effective indoor or outdoor banner can range from sizes as small as 4 feet wide to as large as 30 feet in length or more depending on your need. Although our prices are among the lowest in the industry, the term cheap banners is only a reflection of their low price and not their quality. We sell half price banners in comparison to many local vendors. Not only do you receive fast banners (shipped the next day - overnight) at a cheap banner price but you can also choose from hundreds of sizes and have the option of designing online, uploading your ready-to-print design or let our experienced design team design for you. 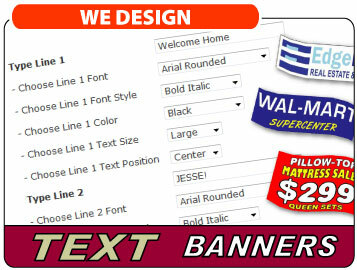 Our quick banners are only a click away!